There's an Echo in My Library! Back in November Amazon announced that it was taking pre-orders for the new Echo - by invitation only. Intrigued, ever geeky, & with a big discount offered as a Prime member - I jumped on it with my own money! (Just in case it was a flop!) It took months of waiting but finally, just a few weeks ago it came and we now have a new information tool in the library! It's the Amazon Echo! Have you heard of it? The original commercial can't be found anywhere...the goofy family with the mom who had the best facial expressions. There are NSFW language parodies, but not the original one. Womp Womp. Since I'm not going to have an assistant full time next year, (don't get me started!) I thought this could be a cool way to answer basic questions. Kids are delighted to discover Alexa, living in the Amazon Echo. 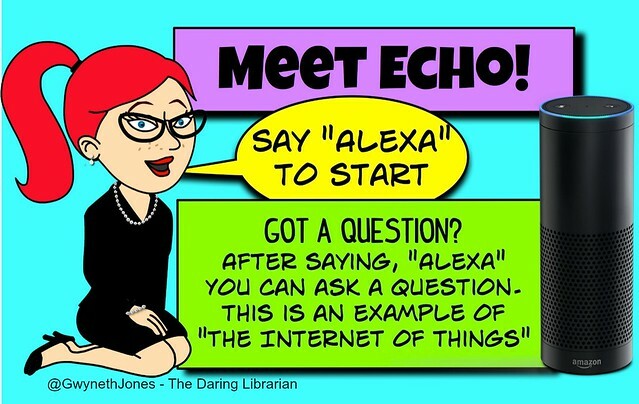 Not only is it a fun way for kiddos to learn how to ask the right questions, to speak clearly, it also introduces them to the Internet of Things. Since it's cloud based, Amazon can automatically upgrade and send OS downloads to the device. Is this cool or scary? I say cool! The new "Simon says" feature is fun to play with. I was in my office checking my email, with the Echo remote handy as one of my 8th grade lunch kiddos came in. I said quietly into the remote "Alexa, Simon says: Hey Mike, it's good to see you again" He just about freaked out! "Ms Jones - it knows who I am!" I rushed out of my office and said, "What just happened!?" Heh heh heh. I even had my assistant, my beloved Ms. Bell, going for a few hours! Yeah, I'm a little bit evil. Here are some examples of my kids discovering their new friend Alexa! 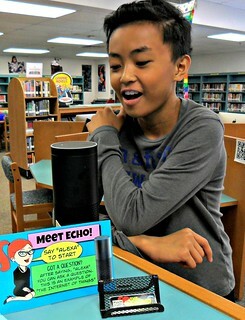 Mia asks @AmazonEcho or the weather forecast at @hcpss_mhms in June 2015 #AmazonEcho #IoT @amazoneducation #RIPVine. To read more about this Google: There's an echo in my daring library! We've also featured it on our MHTV news letting Alexa share the weather desk! 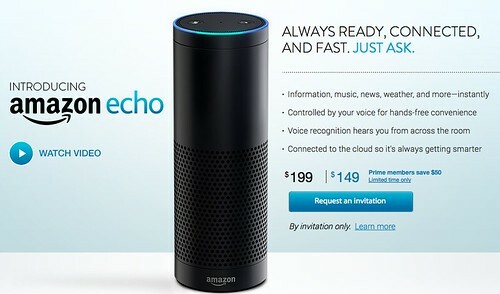 The Amazon Echo was originally available by invitation only & for $50 bucks off for Amazon Prime members. I requested an invite on November 6th, got the invite and ordered in January, and FINALLY received my Echo in May - the pre-order special deal in November was $100 off - that's why I took a chance! Will this tool (I am assiduously avoiding using the word toy) be an asset to our library or a distraction? Time will tell! Teaches kiddos how to phrase a question - this has been fascinating! I'm still learning how to do more things, and the kids are, too! 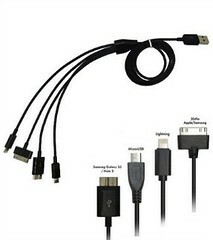 Here's more Amazon Help! But make sure to download the ECHO app and disable the ability to purchase items through the Echo. That was the 2nd thing I did! The Echo Does NOT Replace a Librarian! Dear reader, let me assure you, however, that NO DEVICE invented will EVER be able to replace a certified Librarian! Only a Librarian can give the necessary context to any information, be able to sift through the results like a surgeon, curate the best, and give all that to the student or patron with a smile. Feel like you've read this before? Originally, I had all this info on my Makerspace Starter Kit post, but I decided it deserved it's own post! 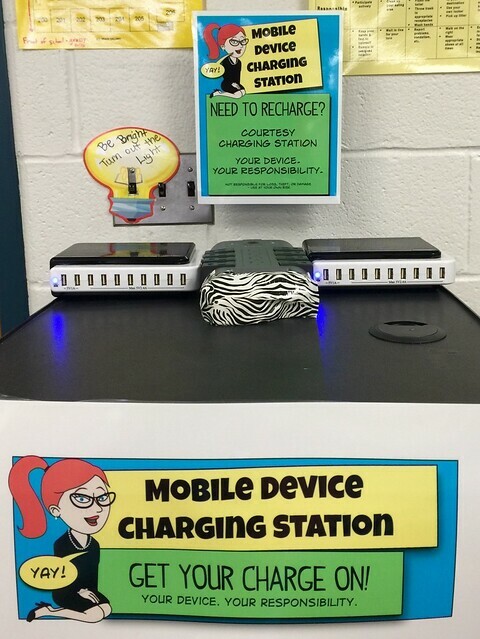 We also have a new Courtesy Mobile Device Charging Station in the MHMS Daring School Library Media Center! Moving closer to BYOD means that kiddos often come to the media center at lunch to charge up. Nothing too fancy, a tall AV cart with a heavy duty power strip, two super fast charging UNITEK 10 USB port hubs and a couple 4-in-1 USB Charging Cords. This is just a start! See? You don't have to invest thousands to make a change. It doesn't have to be all fancy shmancy - just be creative and give it a shot! The look on my kids faces when I put that charging cart there was priceless...they were like WOW! And one said, "this is the coolest library in the world" that's better than satchels of gold! I may even buy this station on Amazon, inspired by Michael Ahr & the RHHS Library Media Center - their blog & Twitter feed is so amazing! I invite you to follow them! The @RHHSPrincipal, Mr. Nick Novak is super inspiring, too! If I ever felt mature enough to move to High School -I'd love to work with these people! Did you know that there are some super cool Easter eggs built in? Here's a hint, say "Alexa: Tea, Earl Grey, Hot"
Thanks for the heads-up on the Amazon Echo. Just submitted my request for a Prime member invitation and can't wait to get started at home. Just wondering how you use it in the library if you don't want pop music playing? Hey Allie! Thanks for your comment! I'm still learning how to manage and to modify the Echo. In the meantime, I don't mind pop music in the library. You can also create brain-friendly Prime playlists like "Classical for Reading"
I'm gonna add a list to the post of things that are helpful that the Echo can do in the library! Appreciate any tips you discover along the way. BTW, Amazon's reply to my request for an invitation began with, "If you're selected..." Really? What was the time frame from your request to their invite? Thanks for your comment, Allie - I added this to the post: "I requested an invite on November 6th, got the invite and ordered in January, and FINALLY received my Echo in May" It seemed like I waited FOREVER when a friend of mine got his earlier, I burned with jealousy! LOL But it was worth it! 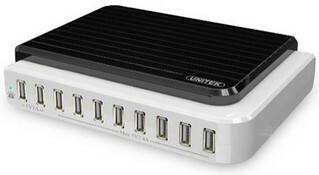 I'm taking it home over the summer vaca to see if I use it at all in my house. WOW, I'm really sorry to hear that - and I understand why you're saying this Anon. I'm trying to be positive about this drastic cut because I love my district .......and my job! I'll just do my best & be a team player. This is AWESOME, and such a great idea. I'm losing my co-librarian next year (she's retiring and they're not replacing the unit), and I'm a little worried about my day being eaten up by basic questions. Thanks for sharing! Thanks for your comment, Laura! Yeah, though a machine can NOT replace a real librarian (one must needs only refer to the Dr. Who Library episodes!) I hope this is going to be a good resource tool! Love the "Tea, Earl Grey, Hot" reference. Interesting discussion about Alexa. Do you have to have a special cloud account to go along with the Echo? Is there a subscription fee? Hi MSS! As an Amazon Prime member, I have access to thousands of resources. It's SO worth the $99 a year or only $8.25 a month! I get FREE 2 day shipping + Instant streaming of TV, movies, & music streaming, and 5GB of cloud storage. I would have the Prime anyway, so the Echo just enhances it! Thanks so much for your comment, I'm honored! Yeah, I hear you, no budget hurts and stinks for both you and the kiddos! Well I bought this with my own $. Sometimes you gotta do, what you gotta do! + I can write it off my taxes, right? Do you know anyone else in a high school with a zero dollar budget? I haven't been able to find anyone. (This past year was $300.00 for books) Over the years I have personally purchased many things with my own money. Thanks, Gwyneth!